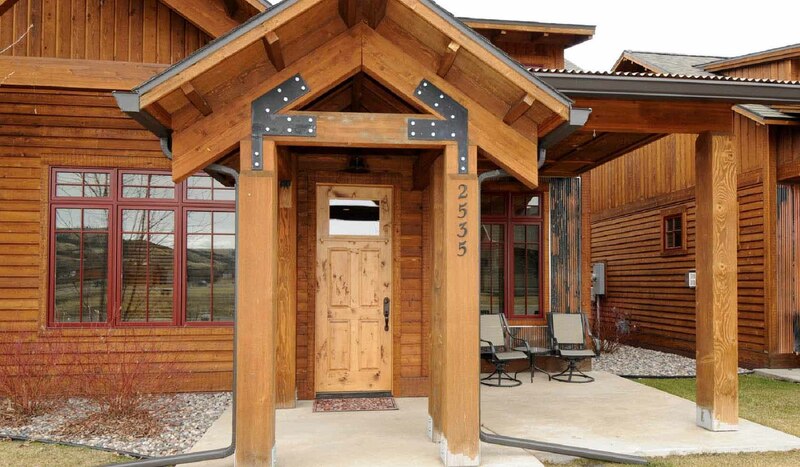 Brand new townhome at the edge of Bozeman with walking trails along Bridger Creek right out the back door. Great location between Bozeman and Bridger Bowl Ski Area. Brief Description: This small comfortably appointed townhome is perfect for smaller groups. It's close enough to our historic downtown to bike or drive easily, but it sits right at the edge of town, with walking trails and great mountain views right there. Guests are surprised to find the fishing on Bridger Creek can be very good just a short walk from the home. You'll be pleasantly surprised by the high quality and handsome rustic details in the home's construction. This is not your average townhouse. Bedrooms and baths: Bridger Bungalow has two bedrooms and two baths. The master bedroom has a queen size bed and a full private bathroom. It has a large closet and a walk-in shower. This bedroom also has a 40' Samsung flat screen TV. The second bedroom has a trundle bed that will make into two twins. The second bathroom is located off the hallway and has a tub/shower combination. For additional sleeping space there is also a pull-out sofa in the living room. Kitchen: The beautiful kitchen is stocked with everything you will need to prepare your meals. It has gorgeous granite counter tops and professional Frigidaire refrigerator and stove. The open layout will allow the cook in the group to enjoy making the meals while everyone relaxes in front of the fireplace. There is also a gas grill on the porch. Dining area: There's a dining table that will seat four comfortably. Just a few feet away there is seating for two more at the kitchen bar. Living room: The living room is open to the dining area and kitchen, with a beautiful gas-fired rock fireplace and a 46' Samsung flat screen TV, DVD player and cable service. There is a cozy couch and two chairs situated to enjoy the ambiance of the fireplace. You'll also find a nice collection of board games and books. Setting, acreage, views: Bridger Bungalow is located at the edge of Bozeman within the new and very nicely done, Legends at Bridger Creek neighborhood. The developers did a great job linking the property into our community trail system (perfect for walking, biking and even cross country skiing), and making it an attractive neighborhood. Activities nearby: Besides hiking, biking and skiing on your trails, you are just across the road from Bridger Creek Golf Course, the best public course in Bozeman, you're just 14 miles from Bridger Bowl Ski Area and a few more from Bohart Ranch Cross Country Sky area. The Bridger Ski Foundation maintains Nordic trails in five areas around Bozeman including Bridger Creek Golf Course just next door. There is fishing on the nearby East Gallatin and main Gallatin Rivers, horseback riding, rafting, and everything that the fun town of Bozeman has to offer. Yellowstone National Park is only an hour and a half away, so be sure to book a tour with one of the fantastic guides at our sister company, Greater Yellowstone Guides. Closest town and airport: You are two miles from Bozeman's Main Street and a 15- minute drive from Bozeman's Gallatin Field Airport.